Welcome to Conch Republic Charters, the Florida Keys' premier charter company. We are located in the heart of the Florida Keys and in the middle of both the â€œsportfishingâ€ and â€œdivingâ€ capitals (Key Largo and Islamorada) of the world! We offer the most unique charter possibilities in all of South Florida. We have put together the most unique and desirable charter programs highlighting the best the Florida Keys has to offer! We cater to dive enthusiasts, big game fishermen and families who want the best vacation possible. Whether it is for the day or for week for either family vacations or company functions, we have the programs to keep you coming back for every occasion. Our staffâ€™s commitment to service is unlike anything you will ever experience. From our captains and crew to our chefs and our planners, we treat every event like it was our own! 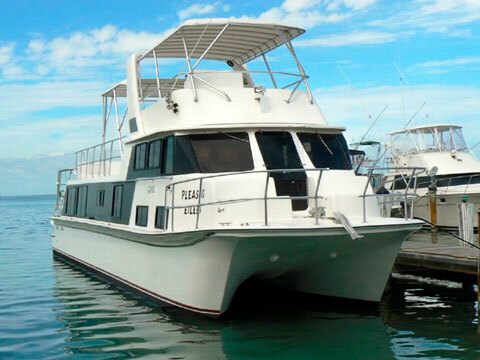 Come aboard and see what we have to offer and join the many satisfied repeat customers of the Conch Republic Charters! We are located at the World Wide Sportsman in Islamorada.